Primary Possibilities: Are you listening? We are a PBIS (Positive Behavior Interventions and Supports) school, so teachers have to word phrases positively for students. Getting the children to listen can often be difficult without yelling, "Are you listening?". 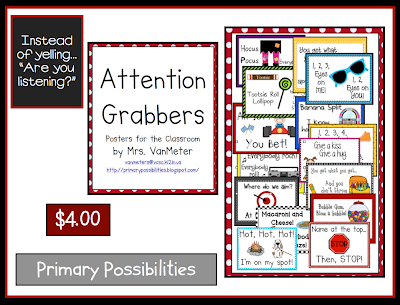 These "attention grabbers" help tremendously with classroom management and getting the attention of all students in the classroom. 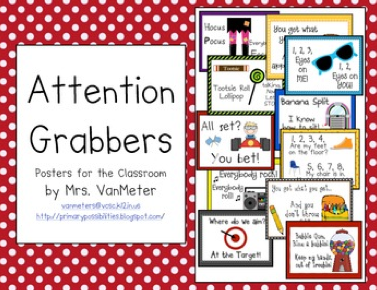 There are several "Attention Grabbers" that I use regularly in my classroom. Some of them are traditional phrases and others are phrases that I have came up with throughout the years and have found to be successful in my classroom. Here are a few that I use in my kindergarten classroom. Teacher: "1, 2, 3, eyes on me." Students: "1, 2, eyes on you." Teacher: "Name at the top." Students: "Then stop!" Teacher: "Where do we aim?" Students: "At the Target." I use this phrase when I want students to look at the Promethean board, an anchor chart, or myself. When I say, "Hocus Pocus" the children say, "Everybody Focus" and put their hands "rounded" around their eyes. Sometimes I even grab a wand and pretend I am circling over their hands. They love it and I get them to focus on a particular skill, chart, or teaching point for a moment. 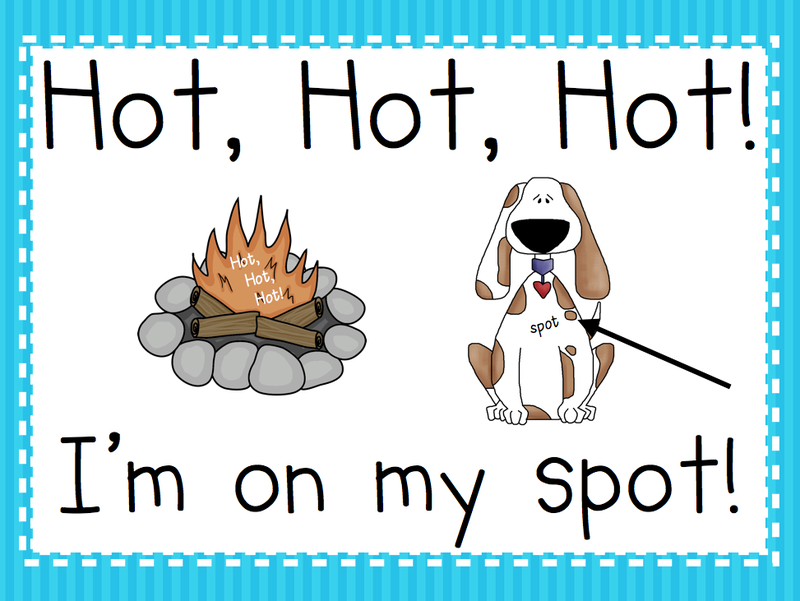 Another one I use regularly is "Hot, Hot, Hot!" When I say, "Hot, Hot, Hot!" my students respond, "I'm on my spot." I use this when we sit on the carpet area. I also say, "Give a kiss. Give a hug. Everybody have a seat on the rug." I recently added this one to the Attention Grabber Packet posted on TpT. Here is the "Hot, Hot, Hot!" 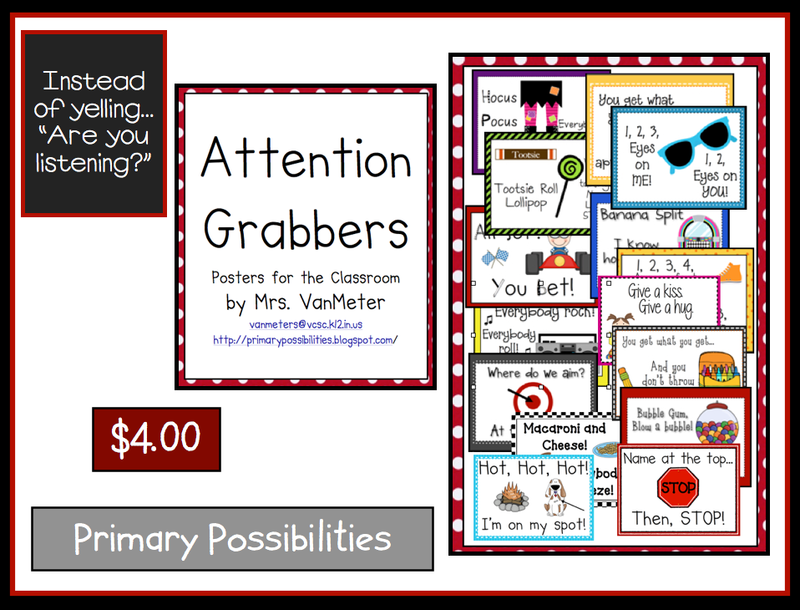 attention grabber poster that I use in my classroom. There are so many that I use daily in my classroom. The posters are excellent visuals for elementary students to refer to. I keep my set on a large ring. If you are interested in purchasing the entire packet, please head on over to my TpT store. Click the image below to link directly to the product. I use all of these in my kindergarten classroom. Using attention grabbers helps reduce disruptions and eases transitions in the classroom. I have found these to be very successful in having control of the classroom and behavior management. Just a simple short phrase gets my students to focus in and allows me to get my teaching point across. Leave a comment telling me which of these attention grabber phrases you like best AND the name you follow our blog with. (Don't forget to include your email.) Later this week, I will use the random number generator to choose 3 educators (at random) to win the entire packet above. 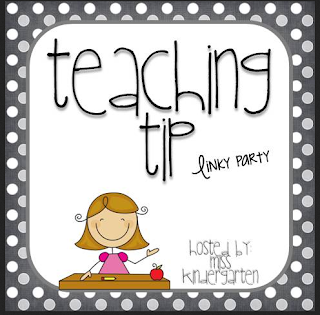 Link up here and share your favorite teacher tip. There have been several teachers who have already downloaded this product. If there are any "attention grabbers" that you would like to be added to this packet, please email me at vanmeters@vcsc.k12.in.us. These are adorable! I use nananana, nananana....hey, hey hey goodbye & goodness gracious.....great balls of fire. Would puffy heart love the visuals! I love hocus pocus..everybody focus. I already use it in my classroom, but now I'm going to have them add making circles around their eyes. Hocus Pocus is my fave. :) I love the idea. I have heard some teachers use them and the kids always sounds super excited. I use "1 and 2" and the students say "eyes on you." Also when I turn the lights off my students know that their hands go up in the air and look at me. 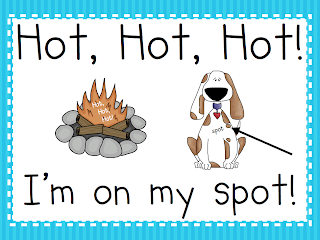 Love Hot, Hot, Hot I'm in my spot. I love All Set? You Bet! Ooh, what a fun giveaway, thanks! I like your "Where do we aim?" "At the Target." attention grabber. I follow you under Lore. I love all of these very adorable attention grabbers!! 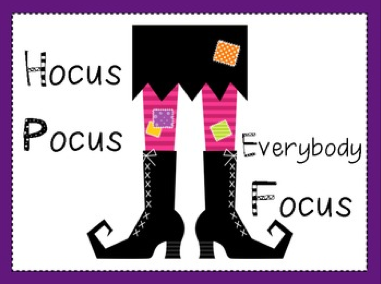 In my class I always use 1,2,3, eyes on me, and hocus pocus everyone focus! I'll definitely try out the rest! I use 'hands on top' 'everybody stop' especially when we are using manipulatives. FOllow you as Suzy Q.
Hocus Pocus, Everybody Focus! since getting all my energetic kiddos focused can be quite a challenge sometimes! I follow as Cherie Mae Ong. I love the Where do we aim? At the Target! I follow as Tammy Wathen. Love this!! Thanks for linking up! Oh my goodness! I LOVE your attention grabber packet! They are all so cute and it would be great to have a cute visual to go with the attention grabbers we use in our classroom. This is such a wonderful resource! I really love the Hocus Pocus! Probably because I LOVE Wicked and so I love witches and witchy feet LOL Yes I am a visual person!! Thanks! Found you from the Linky! Hocus pocus everybody focus is my favorite. I use music to transition my kiddos. I give a direction then when they hear the music they follow the direction they are allowed to talk. This gives me a few minutes to get my act together then I start to lower the volume and when the music stops the students should be ready. Do you have "Macaroni and Cheese" and students respond with "Everybody Freeze"???? That's one of my faves!!! ps the macaroni and cheese a teeny tiny teacher uses is cute!! I follow under Melissa Young. I love the Hot Hot Hot idea for carpet spots. I recently started using "Hold up" students answer "wait a minute" in my class. Thanks so much for this FABULOUS unit! I can't believe I was chosen... Doing the HAPPY DANCE! I absolutely LOVE the Hocus Pocus, Everybody Focus attention grabber. I love that the kids use their bodies (hands around their eyes) too! Awesome! Our school has two parts to its name so I would say the first part, and students respond with the second part. We also do a "hang five" with 2 eyes for watching, 2 ears for listening, and 1 mouth silent. Love your tip! I found you through the linky party and can't wait to read more from your blog! Check out my blog at www.teach-bake-love.blogspot.com!